Every patient is evaluated in a step-by-step process, which starts with an initial phone call 704.510.1555 to determine what kind of testing should be scheduled. This first phone call starts with several questions about your visual concerns, covers the various areas of vision and visual processing that are evaluated, and also includes information about potential treatment options if vision difficulties are found. After this in-depth conversation, evaluations are scheduled. If you're not sure if testing is the right thing to do, you might choose to attend one of our free seminars about various vision problems. 1. What to expect. 2. We test your vision. 3. What else we look for. 4. What we do if we find a problem. This visit is usually 2 hours, but may be only 1 hour for a young child or a patient with relatively mild vision problems, or 3 hours for patients that have had head injuries. We will start by talking about what is going on with your vision. When talking with pediatric patients, they have the opportunity to actively participate from the start of their vision care. This conversation is often an eye-opening experience for parents, as they listen to their child's visual experience in their own words. While parents' concerns have already been noted in the initial phone call, they are asked to expand on anything that came up during the conversation with the child, and other aspects of developmental and medical history are reviewed. For adult patients, we are often told that this is the first time that they feel like they have been listened to about what is going on with their vision. This starting point is essential for planning testing, potential treatments, and any referrals to other professionals. Please be sure to bring a list of all medications and nutritional supplements that you currently take. If you've been to an eye doctor, you know that this takes less than 20 minutes, and might be wondering why we schedule so much time for our evaluations. We make sure to cover these essentials, but continue to investigate with more breadth and depth. In addition to the "free-space" tests, visual function is also assessed with the phoropter (that big, clunky "glasses machine" that makes clicking noises as various lenses are clicked into place in the tubes through which each eye gets a view). For patients who are not able to participate in phoropter-testing (a very young child, a patient with postural problems, or a person who is currently not able to sit still long enough to look through the machine), we employ other hand-held test devices. In general, all the above areas of visual function are tested in a variety of ways, to identify and quantify any problems, and to ensure the validity of testing. 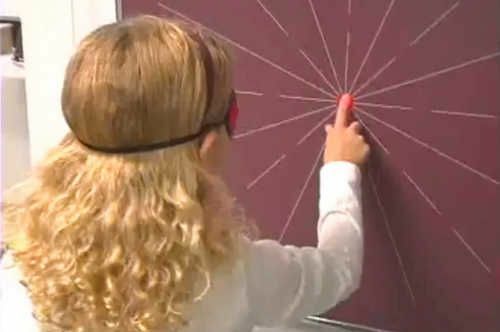 When a visual problem is found during testing, it is brought to the attention of the parent and their family. While identifying a problem might sound like "bad news", the good news is that these problems can be improved in the overwhelming majority of patients. The relationship between the vision problems and the symptoms are usually easy to see. When a problem with eye tracking is identified, we can say, "This is why you skip little words when you read! That must be so frustrating for you." Or a problem with smooth eye movements: "No wonder it's so hard to write your ideas – your eyes don't like to move and tell your hand where to put your pencil!" Difficulty with eye teaming: "Your eyes don't like to pay attention when they look at things up close like books and homework." Poor visual focusing: "Your eyes want to stop working after you've been reading or writing for few minutes." And the good news after identifying each of those problems: "It's not your fault. Your eyes just aren't doing their job yet, and they can get better!" We test for problems that we know how to fix. At the end of the first visit, you should have a good idea of what is working well and what isn't working well. You'll also have an idea of what is involved in fixing the problem. The easiest first step in treatment is often glasses. Even for a patient that already has 20/20 eyesight, glasses might be helpful. Most of our patients either see 20/20, or have glasses that provide 20/20 clarity. Their problems do not reside in the part of the visual system responsible for clear central eyesight. Rather, difficulties with teamwork, tracking, and focusing are problems with the coordination and movement of the clear eyesight from one place to another. And problems with visual coordination and movement often lead to problems with processing of the visual signals, resulting in symptoms like poor visual memory, difficulty with multiple-step sequences, poor spelling, or difficulty with expressive writing. Before we finish the first visit, we can try glasses (even for the person that already sees 20/20) and repeat some of the experiments to see if glasses will help. Sometimes, glasses will be enough to help the visual problems, and a follow-up visit will be planned. Sometimes the problem is more complicated, and optometric vision therapy will be needed. Before we get started with vision therapy, we look even more closely at visual processing at The Visual Perceptual Evaluation.